I still can hardly believe it but we did a day trip yesterday. When ever we are on holiday we say, we must do something in the area back home too but then Michael works weekends and if he doesn’t he is trying to relax and sleeps a lot. But this weekend we really went out and did something. I had picked up a couple of brochures in the museum in Ratingen and in one they featured an exhibition in Aachen with photos from Germany from the end of the war until the reunification, called “Aufbrüche – Bilder aus Deutschland” at the Suermondt-Ludwig-Museum. This sounded interesting and with Aachen being merely 80km away we decided to go there. 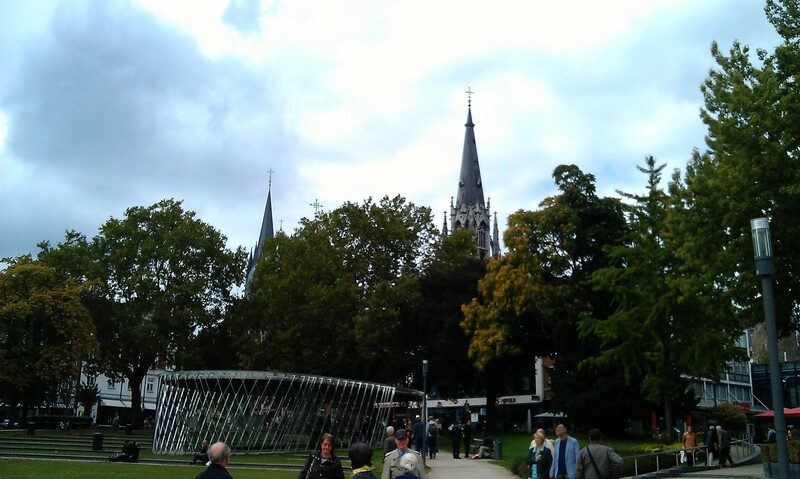 The weather had been rather autumny all weekend long and when it wasn’t raining when we arrived in Aachen we decided to go for a walk first and then to visit the museum. 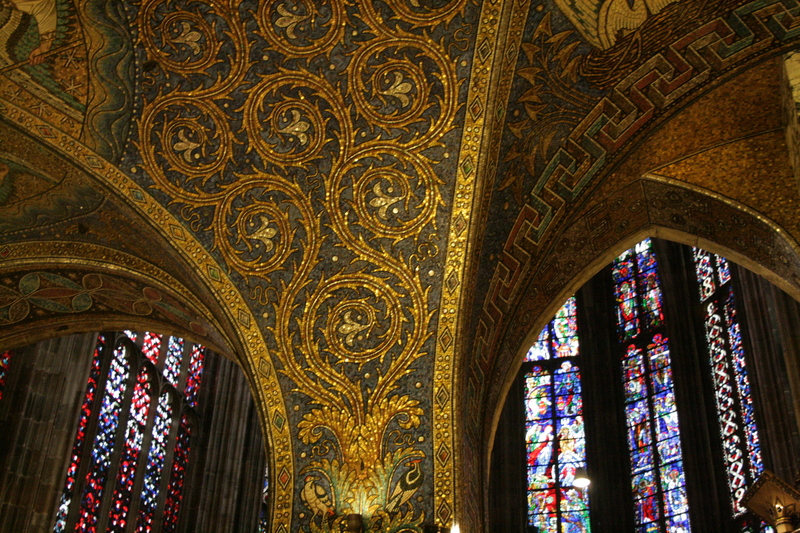 I hadn’t had any real expectations, only knowing Aachen was a really old city where the Romans had camped too and there was a cathedral but that was about all. 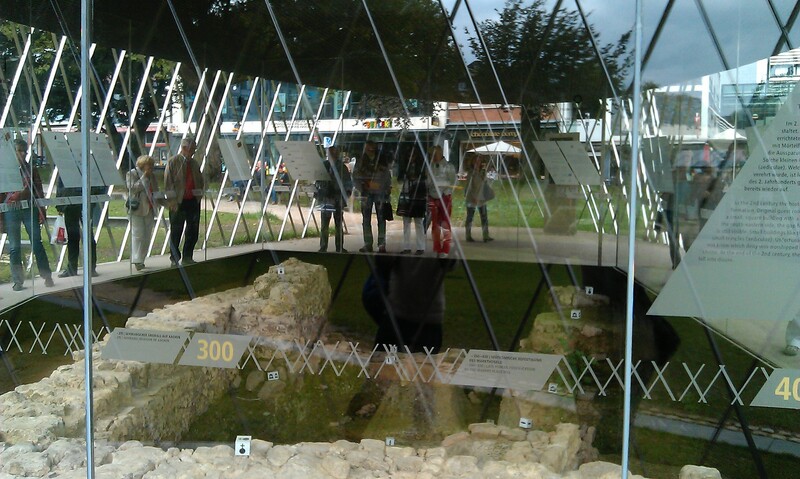 So I was not very surprised when we found a small excavation site in the city center showing the different periods people had lived here (traces show that people already lived here during the Stone Age). And seeing old houses and churches didn’t surprise me either. 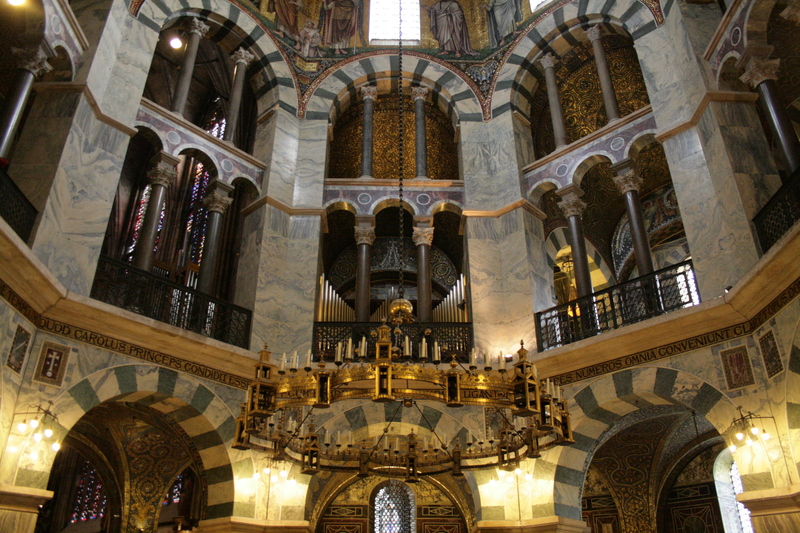 But I was absolutely overwhelmed when we entered the cathedral, the Aachener Dom. From the outside, partially covered in scaffolding, it looked like any other big church to me but from the inside… well, what a beauty! I’m not the most devoted person but I like churches as well as any other religious places (no matter what religion) especially when they are so beautiful. This church is very old, having been the coronation site for German kings and queens for nearly 600 years until the 1531 (now you can guess the age). The interior design was renewed in the 19th century and enhances with all those small shiny mosaic the mightyness of the architecture with it’s Byzantine octagone structure. Honestly, amazing. We then walked past the townhall, unfortunately also partially covered in scaffolding but looking nice with an old swing ride in front (or rather on the back of it, the actual front faces another square but we didn’t take any pictures there). 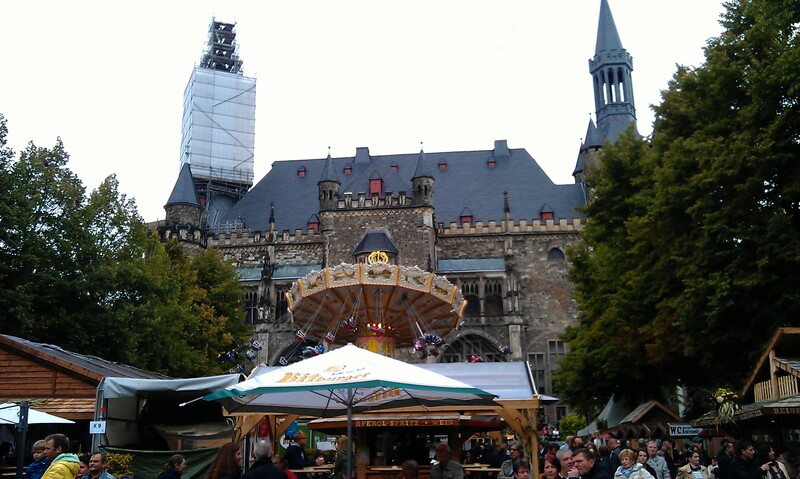 Aachen had a city festival going on this weekend with live music and food stands and for a Sunday afternoon it was well visited. We then went to the museum. The exhibition was nice but 110 pictures had sounded like a bit more than we actually got. The pictures were very interesting but being only about 30x20cm big those 110 photos filled just one big room. I had also hoped to find them more structuredly presented with some pretext to what they were showing. But they only had short texts on the photgraphers if at all. Other than this special exhibition the museum hosts a lot of medieval art,mostly statues of the mother Mary and paintings from different periods of time. I wouldn’t have gone here without the special exhibition but with the exhibition it was an interesting visit. The exhibition still runs until 6th of October so be quick to go if you are interested. 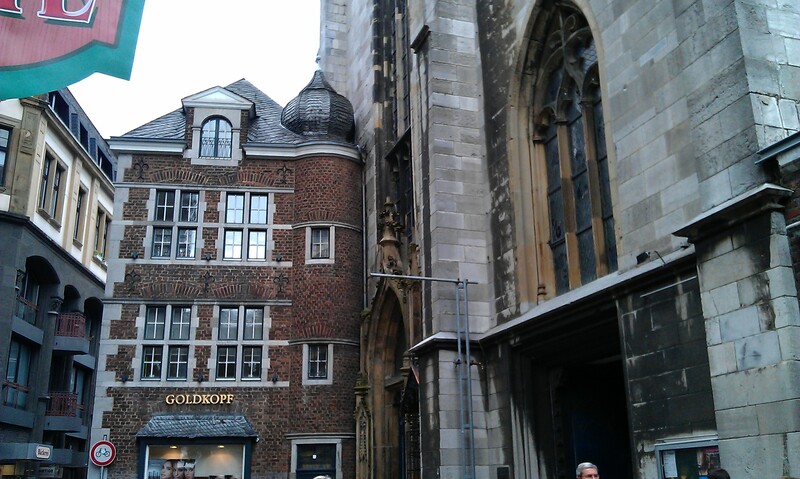 This entry was posted in Germany and tagged Aachen, History, Museum, Short Trip by kathatravelling. Bookmark the permalink. Love the arches!!! Very Beautiful!